After the Maghrib or evening prayers when most Muslims rest briefly before they get ready for another session of nightly prayers during Ramdhan, Fatima Yusuf Lokhandwala has a big job at hand. Around 16 people, both male and female, stream into her brightly lit home at Saifee Burhani Park, the transit home in Mazgaon for the erstwhile residents of Bhendi Bazaar, currently being redeveloped by Saifee Burhani Upliftmet Trust (SBUT). The men, all bearded and traditionally dressed, sit in the front room while co lourful rida-clad women settle down in another room. Soon huge thaals (steel platters) are laid out before these separate groups and a variety of food, including soup, rotis, chicken chilly, mutton masala, biryani and ice cream get served. Post-dinner, the guests silently pray for their host and their spiritual leader Syedna Mufaddal Saifuddin who benignly looks down from a painted wall, which also has photographs of past Syednas. Ramdhan always involves fasting and feasting. But for some Dawoodi Bohras like Fatima and her husband, Yusuf Hatim Lokhandwala, holding iftars at home throughout the holy month is a ritual. “This is mainly for tulul umr (longevity) of our maula (Syedna Mufaddal Saifuddin),” says Fatima, a homemaker who cooks meals for at least 16 guests daily. “From chopping coriander leaves and peeling onions to cleaning the cutlery, I do everything myself,” says the mother of two whose married daughter Khadija sometimes drops in to assist her mother. Apart from seeking a long life for the Syedna, the Bohras invite community members–particularly those they don’t know very well–for food to promote bonding, fellowship and brotherhood. “We keep dining with relatives and friends either at weddings or other occasions. For the iftar dinners we prefer to have strangers and also the financially weak members of the community because nutritious home food is a luxury ,” says Murtaza Dargaiwala, a Masjid Bunder resident. Dargaiwala gives printed invitations to fellow Bohras at mosques during namaz. “If I am inviting 20 guests tomorrow, I will hand over the invitations today itself. If someone decides to cancel, he will inform me well in advance,” explains Dargaiwala, who ensures that each dish is prepared hygienically. The women avoid ordering food from outside and slog for hours over a hot stove to make the food at home. Home-cooked iftar dinners became popular after the late Syedna Mohammed Burhanuddin, in one of his sermons, emphasized sharing mohabbat ki roti (bread of love). “The late Syedna wanted the prosperous to share food with the weak among us. The community kitchen from where every Bohra family gets one good meal daily was his idea. 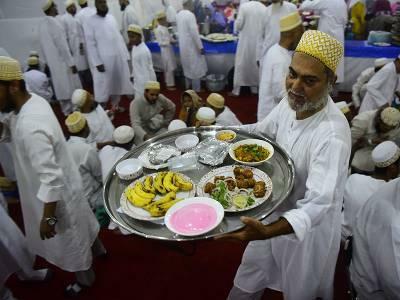 And this spirit of hosting Ramzan dinners is now becoming popular,” says Yusuf Tarwadi, a senior Bohra. Most guests relish the variety of food available at an iftar dinner.”I get to eat many different kinds of dishes. And most importantly , they are home-cooked, non-spicy and hygienic,” says Juzer Latifjeewala who has already attended four home iftar dinners in the last one week.